It seems daring now to write a summarising study about the taxonomy of Conifers and the naming of commercial entries, however, several researchers in interested countries are working on this task to update the knowledge on this botanical trait to build up more handy, more useful, more careful and more clear descriptions by using also the most recent results. The economically developed cultural areas breed a growing number of horticultural variants, ‘cultivars’. This generates the need to give them proper names founded taxonomically, to be differentiated from other existing taxonomical units. This need faces us with two important questions of modern taxonomy. The first is the naming of the genus, species, varietas, subspecies and forms with a validity for the whole world. The second is the clear, unambiguous description of the horticultural cultivars. I think that the answer for the first question is not my task as it would need an international co-operation of wide range between the experts of the coniferous taxonomists and would take a long time. We have a better prospect to answer the second question. Not only the national registration authorities (NRA) need a more solid basis for registration, but an international need is also there to make internationally accepted the work of NRA. It is not an accident that a great work was made by the Royal Horticultural Society, London. Experts of the great exporting nations are also working on different kinds of plant registers. lists, indexes and data pools. Of course a well expressed economical need and interest are behind this activity: the well marketable and successful new selections bring serious royalties and income for the breeders and countries and functions as a trade mark. As the decision of the originality is often questionable. There are no collections where all cultivars and forms of a given genus would be represented and now the possibility is there that plants with different names can not be differentiated. Therefore an international testing organisation would be needed based on existing institutions specialised to different taxons. They would serve the whole world. So the testing and identifying commercial cultivars would be possible and the originality of new commercial cultivars could be secured. When I have begun this taxonomy work, I had quite different ideas. I founded my own conifer collection in 1982, which was named later officially as Mesterházy Pinetum. At the beginning I consulted mostly the guide Krüssmann: Die Nadelhölze, but the answers were in many cases not found. I should stress, this is not the insufficiency of the work cited. Very often I found names that were not included here, because of later selections, and I felt so that I have to screen the literature to see what is the real situation. Of course, I had a strong interest to describe properly the many hundred entries (cultivars, forms) of my collection according to a solidly based taxonomic environment. This work as every such contribution is not perfect, but I hope that this paper will be consulted by many breeders, taxonomists and arboretum specialists, researchers in many countries. Their ideas will be highly appreciated and used to make this work increasingly complete to serve scientific and practical needs. This work aims not only assert the mean trends of the taxonomy, but also to make public the local results. During editing, based on available literature I have included also cultivars, of which taxonomic position has not bees secured (not legitime). I insisted to include them because I am convinced that also cultivars need listing that are existing now independently of the fact, whether they are formally described or not. By this way I would like to inform not only the taxonomy, but I intend to inform also practical breeders and users. During the last 15 years changed the World. The World Wide Web gives new opportunities, that earlier never existed. As I dreamed in 1995, that I could make a book with 200.000 illustrations, now the dream realised and became a real fact. I think now in 2010, we have to divide the conifering history to different ages. The first conifer age existed from the botanical beginnings to 1959, I call it as Classical or Latin Conifer Age. The second age I state till 1993, the Welch book, who made a resume of what he found and collected. This age is speaking of Krüssmann - Horstmann – Grootendorst – Jeddeloh – Barabits – Iseli – Jerry Morris, who were working with a new system, and they found even 200 cultivars in their life. This is the Conifer Hero Age, when great persons were able to work, their names are well known overall the world. This age looks to be unfinished, the documentations are rather poor, even lost. That’s why even Welch couldn’t collect everything, he wanted. Despite all, he is a big hero of this age. He tried, but the technology was simply not enough developed to help him. We have to learn, save and develop further his achievements in detecting conifer cultivars. And now we are living in the 3rd Conifer Age, which is based on computer technology. This age happens today with new heroes, Holata, Slama, Fincham, Smits, Grubb, Sampson, Kohout, Hodi Toth etc. who are working in a wide great area with multimedia and modern technology. The breeding technology is also changed dramatically. Year to year hunderds of witches brooms are harvested in the forests, alpinists are working with the breeders. I brought in 1995 Barabits with his Life Monument to this age, we have the possibility to bring Harper-Morris-Stanley-Fincham-Waxman-Rezek-Dyskra etc. to this age with their Life Monuments, if we write them. We dont need forgotten breeders, we need living breeders, who get light at 40, 50 or 60 of their age. We need living heroes to learn their secrets. We need botanists, who bring down the forests from the mountains to the people as likely dwarfs or any forms, colours. And we need to be informed about conifering news throughout the world as soon as possible. The first 3rd Conifer Age experimental book is published by me about the Hungarian Conifer Treasury. More than 650 hungarian breeded cultivars with full documentation and full service is in. The author stays now in the middle, fully description, photos from the www, and the story, of course. As anybody is reading the book on a computer, will have all possible available informations about the subject. After that the Conifer Treasury 3.0 I hope and guess, this book could be the first general documentation of the 3rd Conifer Age. 17 years after Welch we have about 4000 new conifer cultivars. I hope, this will be a successful document: 14800 cultivar records, 800 species with photo gallery, photos of 4600 cultivars by google connections, 1600 more (of 6000) photos from different sites, which are not available for google (ACS, Stanley, Holata, Edwin Smits, Kohout, Burdan, Daglezja and me), english common names vocabulary, and more and more textal descriptions. After that with partners I would like to publish more national Conifer Treasuries, because these are the future grounds of conifering. Simply to find the creating people, the conifer breeders. Merész vállalkozásnak tűnhet összefoglaló tanulmányt készíteni a fenyőfélék rendszertani besorolásáról, ennek ellenére a világ több országában többen dolgoznak ma is azon, hogy minél teljesebb és minél alaposabb, áttekinthetőbb rendszerben foglalják össze a botanika napjainkig terjedő eredményeit. A gazdaságilag fejlett kultúrterületek egyre nagyobb számban produkálnak új és egyre újabb kertészeti változatokat /'cultivar'/. Ezek bevezetése feltételezi új, az eddigiektől különböző nevek adását annak érdekében, hogy növényeink a jövőben is megkülönböztethetőek legyenek. Komoly igény van olyan kézikönyv iránt, amely a rendelkezésre álló, nagyon szétszórt információt összegyűjtené és hozzáférhetővé tenné mind a nemesítés, mind a felhasználók részére. Ezzel máris két fontos kérdéssel találjuk szemben magunkat. Nevezetesen az első: a genusok, speciesek, varietasok, subspeciesek, formák átfedések nélküli megnevezése az egész világra érvényesen; a második: a forgalomba kerülő kerti változatok névmeghatározásának szabatossága, mással össze nem téveszthetősége. Az első kérdésre való válaszadás nem lehet célja munkámnak, mert a taxonomia részleteinek egész világra érvényes tisztázása sok éves munkát igényelne. A második kérdés körül már több bíztató jelet látni. Nemcsak a nemzeti minősítőintézetek munkája érvényesül itt erősebben, hanem nemzetközi nyilvántartásra való törekvés is van. Nagy részt vállalt magára Royal Horticultural Society, London, valamint a nagy növényexportőr és nemesítő nemzetek. Természetesen a háttérben jól felfogott gazdasági érdekek húzódnak meg: a piacképes, sikeres új szelekciók komoly fajtapénzt hoznak nemesítőjüknek. Mivel az eredetiség elbírálása sok esetben kérdéses, nincsenek olyan gyűjtemények ahol az adott genus minden változata rendelkezésre állna, előfordulhat, hogy a különböző fantázianév alatt forgalmazott változatok egymástól nem különböztethetőek meg. Ezért igen fontos lenne egy olyan nemzetközi vizsgáló hálózat létrehozása, amely a változatokat tudományos alapon vizsgálni tudná, enélkül ugyanis a két igényt nem lehet összhangba hozni. Amikor e munkához láttam egészen más indítékok vezettek. 1982-ben megalapítottam saját fenyőgyűjteményemet, amely a későbbi keresztségben nevet is nyert: Mesterházy Pinetum. A kezdetben sűrűn forgatott Krüssmann: Die Nadelgehölze egyre többször nem igazított útba. Nem a saját hibájából. Mind több olyan név került elő, amelyek nem szerepeltek benne, így nem maradt más hátra, mint belefogni a szerkesztésbe. Természetesen nem csak ez a momentum indította el a munkát, hanem az az igény, hogy alaposan előkészített taxonomiai környezetbe ágyazva sorolja fel a fenyők kerti változatait, amelyeket a rendelkezésre álló irodalom segítségével fel tudtam találni. A mű befejezetlen, hiszen a feltárandó anyag állandó mozgásban van, de talán az első közreadás eljut majd olyan, számomra eddig ismeretlen nemesítőkhöz, arborétumokba, fel nem kutatott országokba is, ahonnét további hasznos információkat várhatok a további bővítés céljából. Ez a munka kísérletet tesz arra, hogy érvényre juttassa nemcsak a taxonomia fő irányait, hanem a flórát legjobban ismerő helyi eredményeket is közzétegye. A rendelkezésre álló irodalom alapján történt adatgyűjtés során olyan cultivarokat is átvettem, amelyekről nem bizonyos, hogy legitim elnevezések. Azt az elvet követtem, miszerint szükséges azokat a cultivarokat is megnevezni, amelyek már létrejöttek, elkerülendő az ismétlődéseket. Az elmúlt 15 évben alaposan megváltozott a világ. A világháló olyan új lehetőségeket nyújt, amelyek korábban sohasem léteztek. 1995-ös álmom most megvalósul egy olyan könyvről, amely 200.000 képi illusztrációt tartalmaz, és valósággá vált. Ma, 2010-ben úgy vélem, hogy a fenyők történetét korszakolnunk kell. Az első fenyőkor a botanika kezdeteitől 1959-ig tartott, melyet Klasszikus (vagy Latin) fenyőkornak nevezek. Addig latin nyelven kaptak nevet a növények, még a kerti változatok is. Utóbbiakat azonban ekkor kivonták a latin névadásból, sőt esetükben megtiltották a latin használatát. Később kiderült, ez serkentően hatott a kerti változatok nemesítésére. A második fenyőkort 1993-ig tekintem H. J. Welch és G. Haddow: The World Chechlist of Conifers c. könyvének megjelenéséig, amelyben összefoglalták a megelőző idők fenyőnemesítéseinek eredményeit. E kor nagy egyéniségek ideje, mint Krüssmann - Horstmann – Grootendorst – Jeddeloh – Barabits – Iseli – Jerry Morris, akik új módszerekkel dolgoztak, és életükben akár 200 új fenyőfajtát is nemesítettek. Ezt nevezem Nemesítői hősi kornak, amikor olyan nagy tudású nemesítők működtek, akiknek az egész világ megtanulta a nevét. Kissé befejezetlennek tűnik ez az időszak, a dokumentációk helyenként szegényesek, néhol el is vesztek. Ma Welch is többre juthatott volna, de ő mégis kora nagytudású hőse, akit még nem segített az információs technológia. Életművét az utódok nemcsak megtanulják, és megőrzik, de tovább is fejlesztik, magam is ezt teszem. Ma a Harmadik fenyőkorban élünk, mely az információs technológiára épül. Új hősöket ismertünk meg Holata, Slama, Fincham, Smits, Grubb, Sampson, Kohout, Hódi Tóth személyében, akik nemcsak kihasználják a széles informatikai lehetőségeket, de nemesítési módszereik is drámaian megváltoztak. Az erdőkben ipari méretekben folyik a bábaseprők „aratása” évi több százas nagyságrendben, alpinista segítőkkel kiegészítve a nemesítői kutatásokat. Remélem, hogy Barabits Elemér életművének 1995-ös kiadása áthozta őt az új korba, és sok más jelölt - Harper-Morris-Stanley-Fincham-Waxman-Rezek-Dyskra – megírandó életműve is segít majd munkásságuk eredményeinek frissen tartásában. Helyettük az általuk megalkotott növények világa szól eredményeikről. Nem elfelejtett, hanem élő nemesítőkre van szükségünk, akik 40, 50 vagy 60 éves korukban juthatnak elismeréshez. Élő hősökre van szükségünk, akiktől tanulni lehet. Olyan botanikusokra is szükségünk van, akik a távoli hegyvidékek növényeit lehozzák az emberek közé akár magukban, akár szerethető törpe vagy színes növényváltozatok képében. Természetesen azt is szeretnénk, hogy a növénynemesítés legújabb eredményeiről minél gyorsabban tudomást szerezzünk. A dokumentálás módszereinek is alkalmazkodniuk kell a felgyorsult világhoz. A Harmadik fenyőkor első kísérleti könyvét magam írtam meg Magyar fenyők kincsestára címmel, melyben 650 magyar nemesítéső fenyőváltozat lehetőleg teljes leírására vállalkoztam. A középpontba a nemesítő kerül szerzőként, és minél teljesebb szöveges és képi anyag felvonultatása a cél. Ha valaki vezeték nélküli internettel ellátott számítógépen olvassa e könyvet, gyorsan a teljes információ birtokába kerülhet – még egy erdő közepén is. Ha egy nemesítő ilyen számítógéppel járja az erdőt, akár a helyszínen is megnézheti adatbázisát, hogy valóban új növényt talált-e? E törekvések épültek be a Fenyők kincsestára 3.0 új kiadásába, amely reményeim szerint jól alkalmazkodhat felgyorsult technológiai elvárásainkhoz. Welch 1993-as utolsó könyve óta 4000 körüli az új fajták száma – amelyekről tudomásom van, - a fenyőfajták világméretű „gyártása” egyre gyorsuló ütemben folyik. A Fenyők kincsestára 3.0 800 fajról ad képgyűjteményt, 14800 fenyőfajta ismert, melyekből 4600 fajtáról van Google által gyűjtött képanyag, további 1600 fajtáról egyedi honlapok adnak képeket (a közreadott 6000 képből) olyan forrásokból, amelyeket a Google nem lát. Összességében a létező fenyőfajták 42 %-a már képpel illusztrált. A jelentős további fejlődés alapját az aprómunkával felderített, nemesítőkig eljutó gyűjtéstől várom, mely egyes országok növényanyagára figyel. A cél az alkotó nemesítők megtalálása. Bonsai Catalogue of John Vermeulen & Son, Inc.
Catalogue of Pieter Zwijnenburg Jr. The Geobiology and Ecology of Metasequoia, edited by Ben A. LePage, Christopher J.
Williams and Hong Yang, c Springer 2005. 361-366. p.
Krüssmann, Gerd: Handbuch der Laubgehölze, Registerband. Farjon, Aljos: World Checklist & Bibliography of Conifers 2001. 2nd edition. Sources of the available photos from the web collected by Google: more ten thousands of sites, which’s photos are seen by Google, all together 3,5 million conifer photos. Thanks to all organizations, education, nurseries and privats throughout the World, who cares conifer photos on their sites. Special thanks to the Gardenweb conifering sites, where the visitors collected in the last years thousands of their own high quality conifer photos – and most of them are high educated professional nurserymen, or enthusiast conifer friends with high quality photoing knowledge- but sorryfully they work with nicknames. This year we published 138 new conifer cultivars, 1375 new photos. In case of uncomplete information the position of the datas show their meanings. [ 1] The name of the genus Level 1. [ 4] The name of the species Level 2. [ 8] Unvalid or synonym name for Level 2. "ssp." is the sign of "subspecies"
 "var." is the sign of "varietas"
 Date,name,country of founder of a "cv." 3. varietas, subspecies, forma and "CULTIVARS"
Természetesen ennyi adat nincs minden tételről, a közölt adatok pozíciója mindenképpen egyértelművé teszi annak jelentését. Found as a broom in Eastern Siberia. A. picea Lindl. 1838 not Mill. var. BREVIFOLIA Hort. ex Dall. Found as a broom in SWI, 125x150 cm. Hexenbesen, gefunden in der Schweiz, 125x150 cm. Jahren: ca. 30cm. Kohout text. Fund von Lenka Šimánková im Jahr 2014 in Österreich, geerntet im Jahr 2015, in der Höhe von cca 20 m, dichte, kompakte und gesunde Hexenbesen, Durchmesser cca 70 cm, Zuwachs cca 3 cm. Šimánková text. Abies alba ‘Almkogel’ - nález Lenka Šimánková v roce 2014 v Rakousku, sklizeno 2015, ve výšce cca 20 m, hustý, kompaktní a zdravý čarověník, průměr cca 70 cm, přírustky cca 3 cm. Eine ausgewachsene Tanne, die in ca. 25m Höhe eine sehr locker wachsende, auffällige, riesige Hexenbesen aufweist. Gefunden am 30. Juni 2013 im Hausruckwald, Ampflwang, Oberösterreich, AUT. Schneider text. Schneider # 64, found on 30th June 2013. Abies alba ’An der Wand’, GPS 409 AA 2 B, HB. B, ca. 2 m Durchmesser, ca. 40 cm hoch, flach wachsend, Nadeln – 1 cm, Zuwachs – 10 cm, Nadelfarbe hellgrün, Nadeln leicht halbrund angeordnet. Fundort: Mohr Zweiersdorf, Hohe Wand, Abhang Museum Ri. Waldegg, NÖ, 994 m ü. Schneider text. Schneider # 911, found on 17th Nov 2017. Abies alba ’Aschergraben’, GPS 397 AA 1 BC, HB, BC, ca. 1,6 m Durchmesser, 60 cm hoch, flach wachsend, in ca. 2,5 m Höhe, Zuwachs – 5 cm, Nadelstellung flach, Nadelfarbe dunkelgrün, dünntriebig, war bisher im Schatten. Fundort: Mohr Zweiersdorf, Hohe Wand, Abhang Kleine Kanzel, Ri. Plackles, NÖ, 1.008 m ü. Schneider text. Schneider # 906, found on 16th Nov 2017. Breite in 10 Jahren: 50cm. Kohout text. foliage, leaves are looking forward. Laposan elfekvő mutáció az ágakon előrehúzó tűkkel. A witch’s broom with regular conical habit, 2 m.
high at age of 30 years. Yellow on the top. amelynek vezérhajtása feltűnően sárga színű. forward. 1.2 m.high at age of 30.
anyanövény 30 évesen 1,2 m.
A narrowly pyramidal form with excellent deep green foliage. 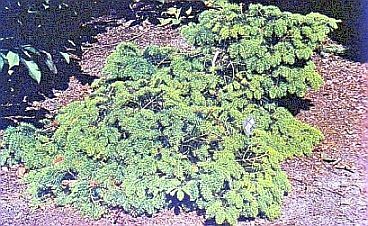 Abies alba ’Bruck’, neu, HB, B, Fundort: Richtung Himberg, von Bruck, Gemeinde Puchberg aus, in ca. 8 m Höhe, ca. 2,5 x 1,5 x 0,7 m, sehr dicht, Nadeln gelbgrün, Zuwachs – 5 cm, 301116 Reiserentnahme ca. 20 %. Schneider text. Schneider # 798, found on 30th Nov 2016. A bronze-gold leaved compact European fir of seed. A slow-growing, globose flat-topped fir with rich, glossy green foliage. Found as a witch’s broom by Tomas Kubat of the Czech Republic. Min. Zone: 4 Growth Rate: 2-3" HxW@10yrs: 2’x2’. Brent Markus text. Hexenbesen, Miniform, flach und sehr dicht wachsend, alle Zweige leicht nach unten gekrümmt mit grüner Benadelung Zuwachs pro Jahr: 2 - 3cm, Höhe in 10 Jahren: 15cm, Breite in 10 Jahren: 25cm. Kohout text. It is indeed compact, a fine plant from Parsons Nursery in New York way back in 1887 and now rare in cultivation. Arrowhead text. Abies alba ’Dollfuß Kirche’, (DOLLFUSS KIRCHE), HB, B, ca. 70 cm Durchmesser, 50 cm hoch, Zuwachs – 15 cm, dicht werdend, Nadelfarbe dunkelgrün, Nadelstellung leicht halbkreisförmig. Fundort: Mohr Zweiersdorf, Hohe Wand, nahe der Dollfuß Kirche, NÖ. Schneider text. Schneider # 904, found on 15th Nov 2017. A nice little green witches broom, fresh green in spring, grows prostratous. In 10 years needs small place, no more, than half a meter. Mesterházy text. Found as a broom by Šimánek Milan in 2014, part harvested in 2015 around village Eisenhut in Austria AUT, diameter 150 cm. Abies alba 'Eisenhut' - nález Milan Šimánek v roce 2014, částečně sklizen 2015 okolí vesnice Eisenhut v Rakousku, průměr cca 150 cm. Šimánek text. Abies alba ’Engelbert’, HB, AB, in mehr als 20 m Höhe, ca. 80 cm Durchmesser, 40 cm Höhe, flach wachsend, sehr schöne Form, sehr dicht, Zuwachs – 10 cm, Nadelfarbe leuchtend grün, Nadeln dicht, halbkreisförmig stehend, reicher Besatz an männlichen Blütenzapfen. Fundort: Mohr Zweiersdorf, Hohe Wand, neben Wanderweg, von der Dollfußkirche ausgehend, nach ca. 150 m, Hohe Wand, NÖ. Schneider text. Schneider # 912, found on 17th Nov 2017. Abies alba ’Feichtaberg’, HB; AB; in ca. 20 m Höhe, ca. 60 cm Durchmesser und Höhe, eher locker, grün, sehr kurze Nadeln, ca. 7 – 8 mm lang. Fundort: Feichtaberg, rechte Geröllhalde hinauf, zur 2. rechten Geröllhalde gewechselt, ziemlich oben, auf der rechten Seite der Geröllhalde. Schneider text. Schneider # 834, found on 16th March 2017. Nález Milan Šimánek (CZ) v Rakousku, velmi kompaktní koule, přírustky asi 3 cm, zdravý čarověník. Rich, dark-green needles on this slow-growing fir have a glossy, smooth texture with silver-white undersides. Prominent buds make this globose conifer outstanding in winter as well! Min. Zone: 4 Growth Rate: 1-2" HxW@10yrs: 1’x1’. Brent Markus text. moderate size make this an excellent focal point. Iseli text. Different from Torulosa this originated at Secrest in 1979, it is pendulous with twisted branches. Arrowhead text. A full-bodied, semi-pendulous conifer with glossy, rich green needles. Main leader wanders sideways providing a vertical visual interest and the reason for its name. Prefers sun in well-drained soil. 8' tall x 4' wide in 10 years. Hardy to -20 degrees. USDA zone 5. Buchholz text. Abies alba „Grosse Kanzel“, Fundort: Hohe Wand, NÖ. Finder: Krejci, Durchmesser ca. 80 cm, Höhe ca. 20 cm, Zuwachs bis 5 cm, ein sehr schöner, kreisrund gewachsener Hexenbesen. Schneider text. Hohe Wand, NÖ., Abies alba ’Grünbach’, neu, HB, AB, Fundort: Fuß der Hohen Wand, Gemeinde Grünbach, in ca. 6 m Höhe, ca. 1,5 m Durchmesser, kugelig, sehr dicht, alt, Zuwachs ca. 3 cm, 281116 Reiserentnahme ca. 20 %. Schneider text. Schneider # 793, found on 28th Nov 2016. 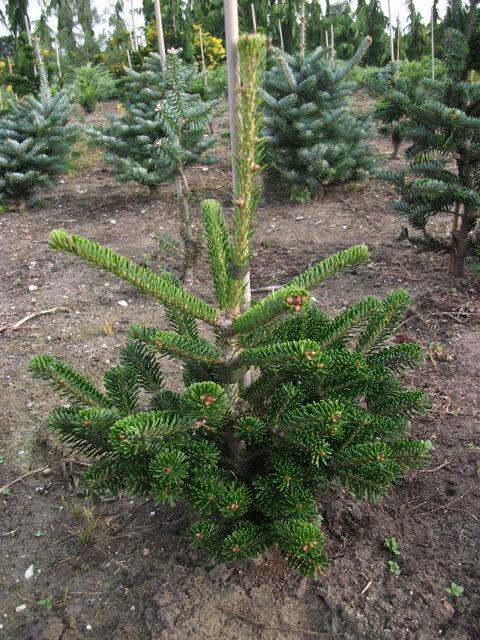 This compact, slow-growing fir has light-green foliage and new growth an even lighter green. Undersides of the needles sport a bright silvery-white color. Brent Markus text. Found as a broom by Milan Šimánek 2014, part harvested in 2015 near the village Novosedly in southern Bohemia, a diameter of about 50 cm, light green needles. Abies alba 'Hemlíček' - nález Milan Šimánek 2014, částečně sklizen 2015 blízko vesnice Novosedly, průměr asi 50 cm, světle zelené jehličí. Šimánek text. Meiersdorf, Öd, NÖ., Abies alba ’Hohe Wand’, neu, HB, AB, Fundort: Hohe Wand, nahe Turmstein Hütte, in ca. 12 m Höhe, ca. 1,5 x 1 m Dreieck, 50 cm hoch, flach, dicht, Zuwachs – 5 cm, 281116 Reiserentnahme ca. 60 %. Schneider text. Schneider # 792, found on 28th Nov 2016. This attractive, slow-growing European White Fir has a distinctive horizontal habit with compact branches spreading out in low, dense layers. Shiny green needles with silvery undersides cloak the silver-barked branches and give the plant a refined, classy look. Originally found as a witch's broom at Holden Arboretum, in Kirkland, Ohio, this namesake forms a mound that stays wider than tall. Soft, new spring growth and dainty tan buds add to its year-round interest. Iseli text. Found as a 60x40 cm broom in Bujesily, growth rate 5 cm a year. Místo nálezu, obec Bujesily, okres Rokycany. Čaroveník po schozu, tvar plochý, rozměry 60 x 40, roční přírůstek do 5 cm. Balatka text.